Creamy Orzo Pasta is gourmet enough for special occasions but on your table in less than 25 minutes! 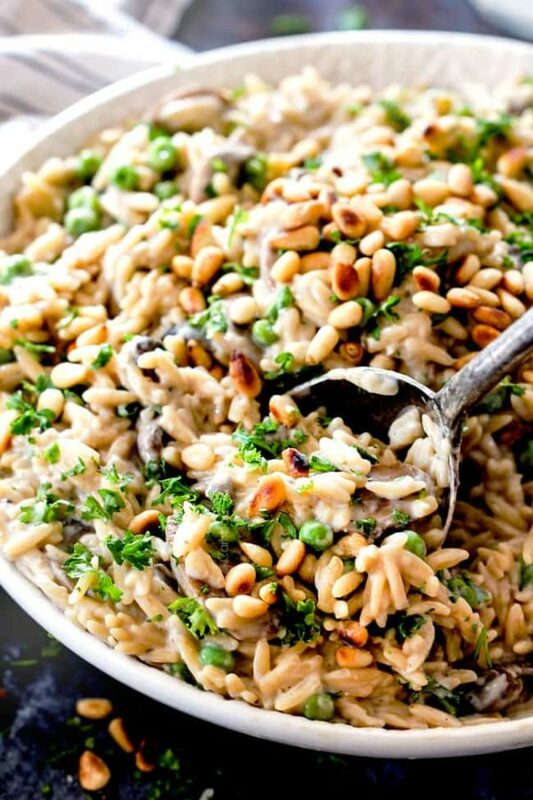 This Orzo Pasta is loaded with caramelized mushrooms, petite peas, and toasted pine nuts bathed in a luscious Asiago Thyme Sauce. 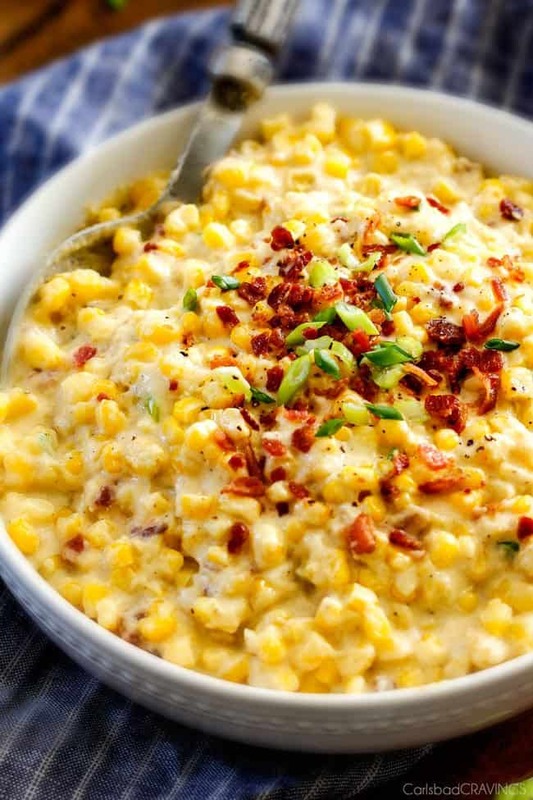 It is OUT OF THIS WORLD delicious, all cooks in one pot and is super simple to make. It is completely customizable with different veggies or add chicken, shrimp, beef or Italian sausage and call it dinner. I hope you’ve enjoyed following along with me on Instagram where I’ve been sharing a “week of Thanksgiving” recipes. 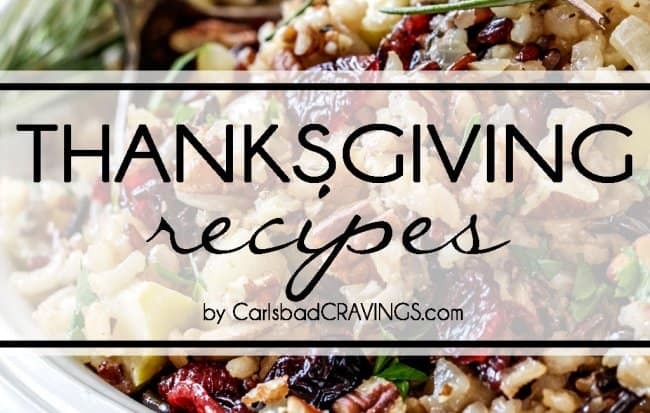 If you’ve missed it, you can see all my Thanksgiving recipes at a glance or in a categorized round up post. I am taking the week of Thanksgiving off so I am leaving you with one more Thanksgiving recipe, this decadently delicious Mushroom Orzo Pasta. Out of everything I could have served you up, I am wanted to share this Orzo Pasta because it is so rich and creamy and deceptively simple to make. It reminds me of creamy orzo in texture without all the time and hassle. While orzo might not be a traditional Thanksgiving side, this Creamy Mushroom Orzo Pasta should be. 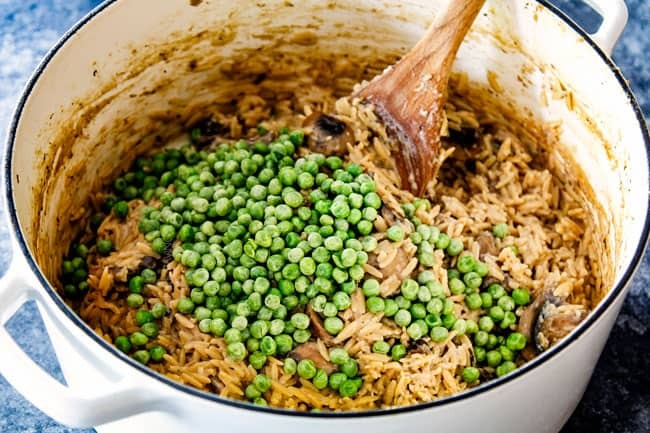 It goes fabulously well with turkey and just about any other protein, and because it’s orzo instead of rice, it doesn’t get mushy but remains luxuriously creamy. As Patrick was oohing and ahhing over this Creamy Orzo Pasta, he asked, “What kind of rice is this?” But orzo (also known as risoni) actually isn’t rice at all but a form of short-cut pasta, shaped like a long grain of rice. 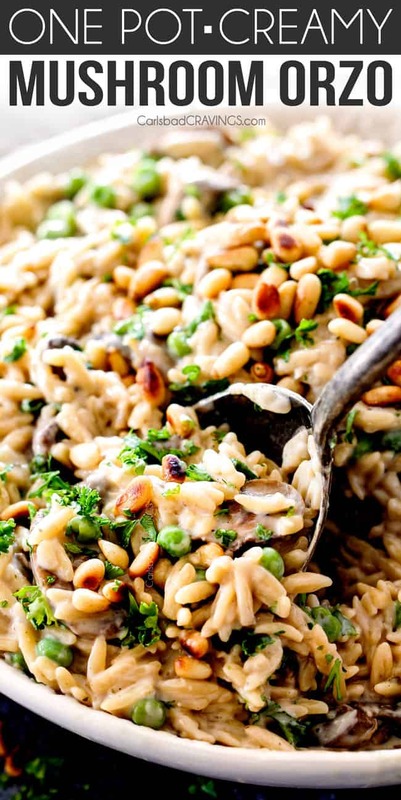 I chose orzo for this Creamy Orzo with Mushrooms recipe because of its fabulous texture. 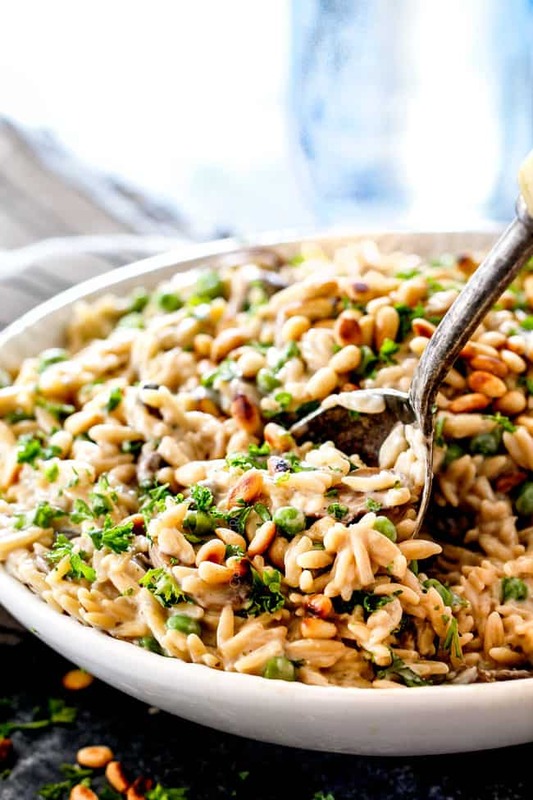 To me, orzo tastes like creamy risotto when smothered in sauce like in this recipe and in my Italian Chickeen Orzo Pasta and Parmesan Meatballs and Orzo and tastes more like traditional rice when not smothered in sauce like in my Southwest Orzo Salad. For this one pot Cheesy Orzo recipe, we want to create the risotto effect but without all the time or effort, just the velvety creamy texture. Winning. What is orzo pasta made out of? Orzo is usually made from white flour, though it can be made from whole-grain flour. For this recipe, we are going to use the traditional white-flour orzo. Both orzo pasta and rice are categorized as cereal grains. 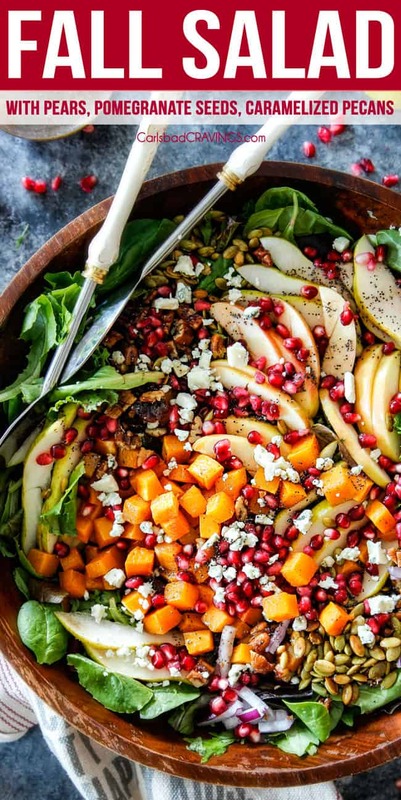 Quick: It can be on your table in 25 minutes. Easy: If you know how to stir, then you can make this orzo pasta! 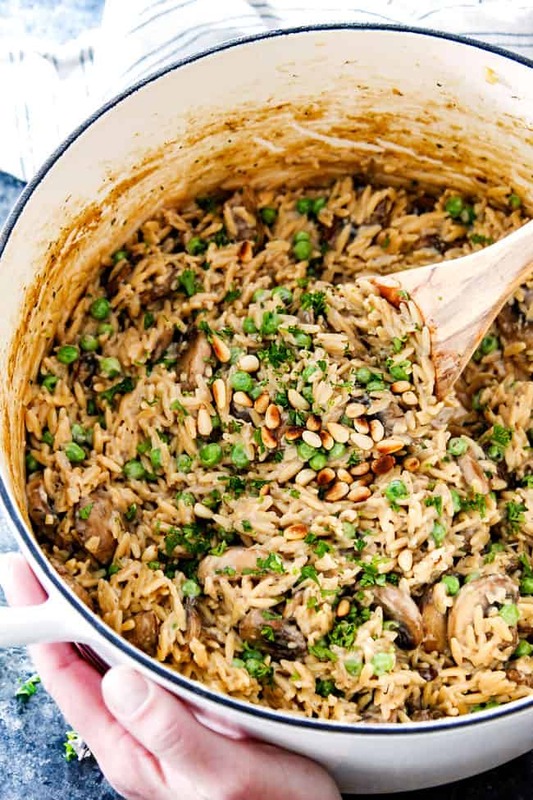 One Pot: The mushrooms AND the orzo pasta cook together in one pot for maximum flavor and the easiest cleanup. Customize: I’ve added mushrooms, and petite peas to my creamy orzo pasta but you could add spinach, tomatoes, zucchini – whatever veggies you have on hand. 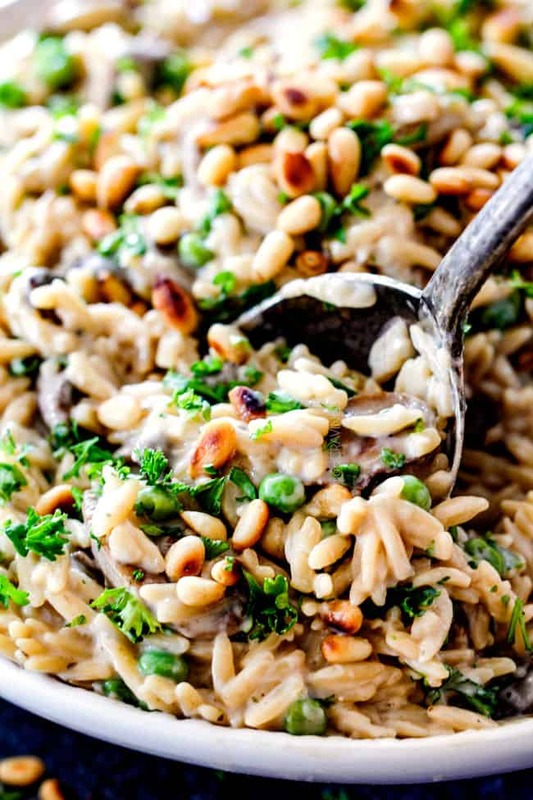 Make it Dinner: This orzo pasta is a side or dinner all in one! I added shredded rotisserie chicken to my leftovers to make it meal, but it would be fabulous with any protein. Scale Up or Down: This orzo pasta recipe can be cut in half or doubled, or tripled. If you scale up, or down, you will need to watch the cooking time. 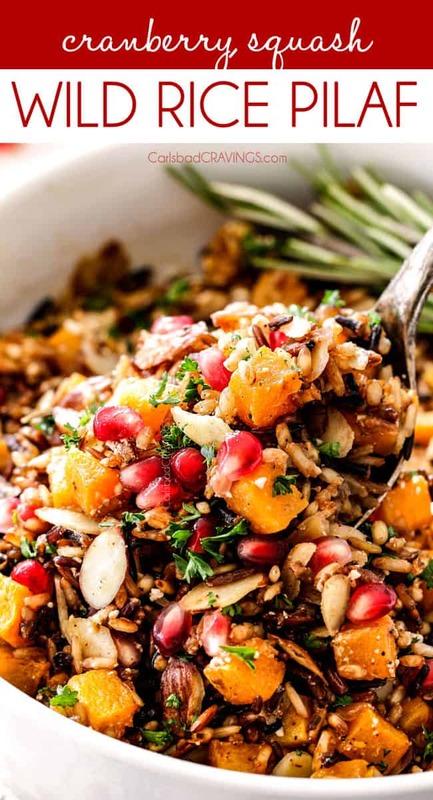 Make Ahead: This orzo pasta reheats beautifully so whether you’r reheating it for Thanksgiving or simply for lunch the next day, it will taste like its fresh off of the stove. Cook Mushrooms. Melt butter with olive oil in a Dutch oven/stockpot. Add mushrooms and spread into an even layer and let cook for cook for 3 minutes without moving. Add shallots and cook and stir an additional 3-5 minutes, until all the liquid is evaporated and mushrooms are browned. Add soy sauce and garlic and cook 30 seconds. Cook Orzo Pasta. Stir in all remaining Orzo ingredients up through salt and pepper. Bring to a boil then reduce to a simmer. Simmer, uncovered for 5-8 minutes, stirring often. Test your orzo at 5 minutes and continue to cook until al dente. Your orzo pasta will be a little “soupy” which we want for the base of our cream sauce. If it is not soupy for whatever reason, that is okay, you can just add more milk at the end of cooking to make it creamier. Add Cheese. Once orzo is cooked, stir in cream cheese until melted followed by Asiago cheese until melted. Add Peas. Stir in peas and warm through. If you are adding spinach, this is when you would add your spinach as well. Customize. Add milk until it reaches desired creamy consistency. Stir in pine nuts and season with freshly cracked salt and pepper to taste (I like additional salt). Garnish with fresh parsley if desired. Mushroom variety. You can use whatever mushrooms you prefer, but I suggest button mushrooms because they are nice and mushroomy. Don’t Submerge Mushrooms. Don’t submerge your mushrooms in water to clean them, instead use a damp paper towel. If you rinse mushrooms in water, they will absorb water like a sponge and not brown as well or become as flavorful because they are full of water. Salt at the end. Add salt and pepper when instructed with the rest of the broth ingredients. If you salt your mushrooms while cooking, it will prevent them from browning in the pan. Be patient. 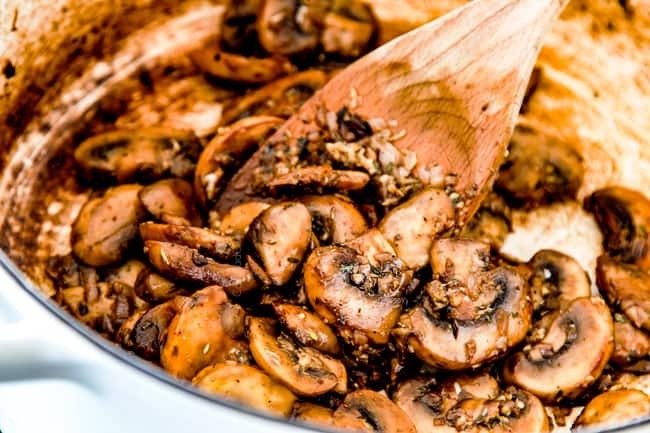 It is tempting to not cook your mushrooms to the point all the liquid is absorbed, but keep cooking until they are browned all over for maximum flavor. Stir! 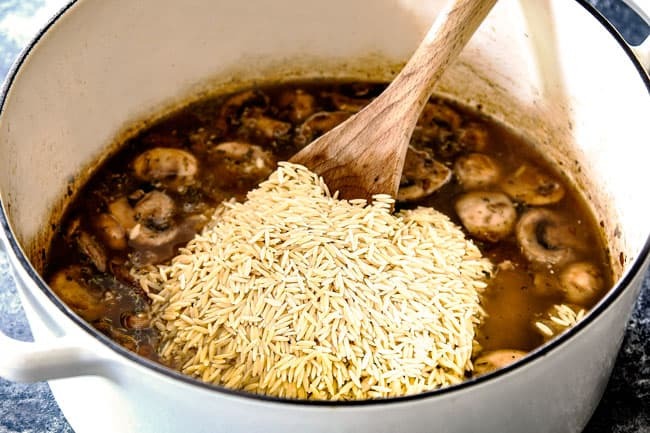 We are using less liquid to simmer our orzo pasta because it is being absorbed into our orzo for maximum flavor and becoming the base of our sauce. 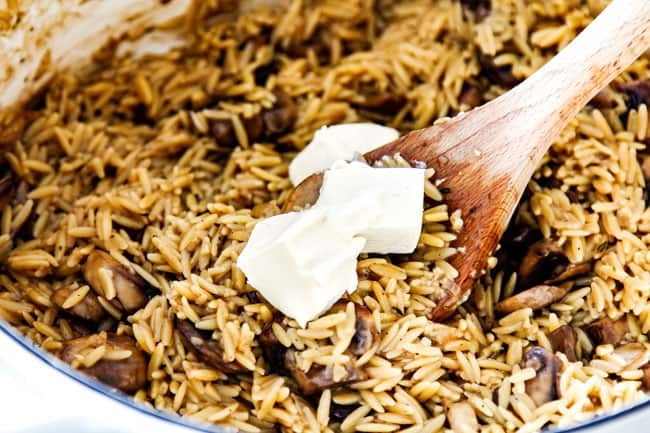 Consequently, make sure you stir your orzo often so the orzo pasta doesn’t stick to the bottom of the pan and burn. Cheese. Asiago cheese is wonderfully sweet and nutty. If you would like a less pronounced taste, use 1/2 cup. We like 3/4 cup around here but that does mean a strong Asiago taste. You can add less then add more to taste if you wish. Cheese Substitute. 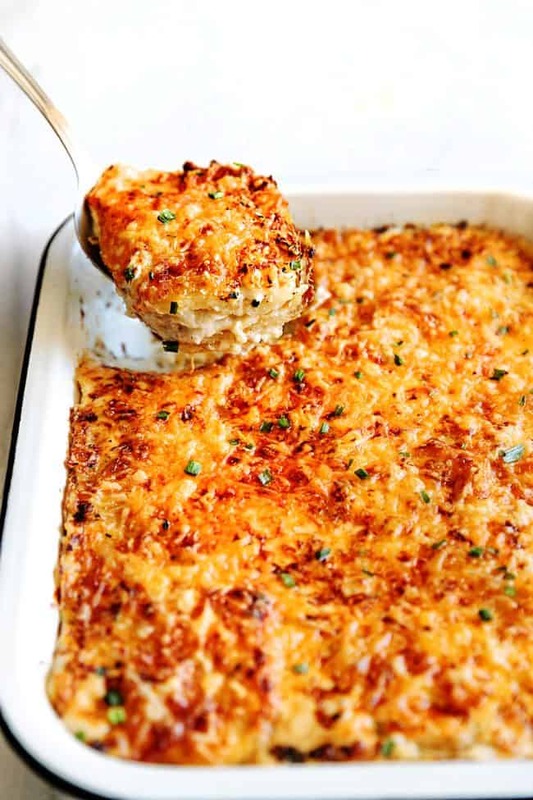 You may substitute Asiago with Parmesan although I prefer Asiago, so I highly suggest you try Asiago one of these times – its flavor can’t be beat in this orzo pasta recipe. 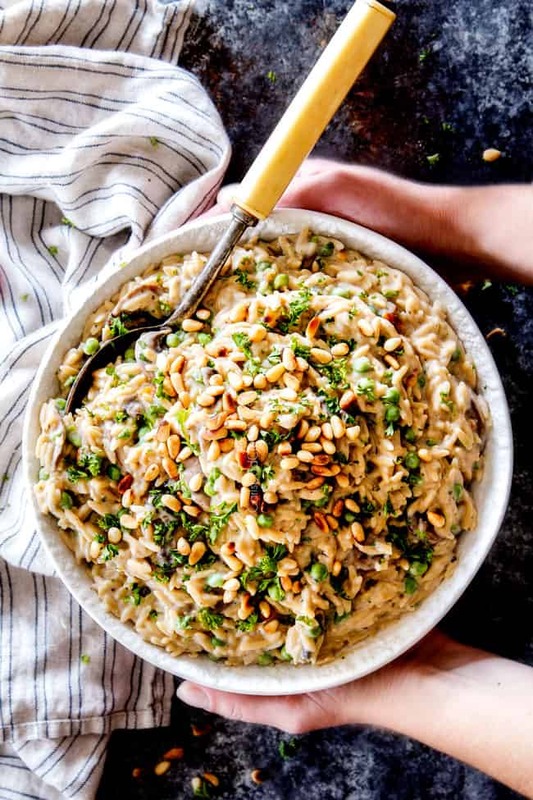 Nuts: I love the earthy toasted crunch of pine nuts in this orzo pasta but you may substitute pistachios, sliced almonds or chopped pecans or walnuts. Is orzo pasta good for you? Orzo pasta boasts twice the protein of brown rice and is a good source of thiamin and niacin as well as some B6, folate, iron and zinc. Brown rice is a good source of thiamin, niacin, riboflavin, B6 as well as some iron, zinc and selenium and has twice the fiber of white rice. White rice, on the other hand, while a good source of zinc, has only small amounts of nutrients. 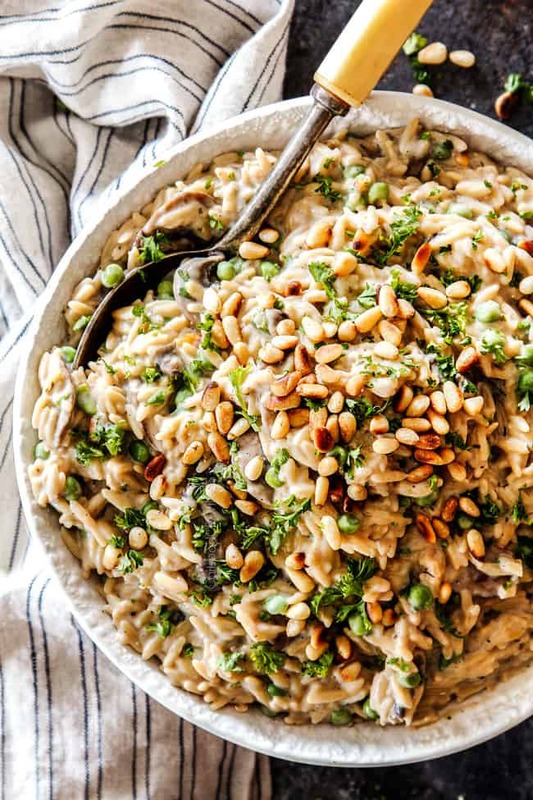 Orzo is a glucose bearing carbohydrate that creates serotonin, the “happiness neurotransmitter,” and eating this Creamy Orzo Pasta will certainly make you happy! 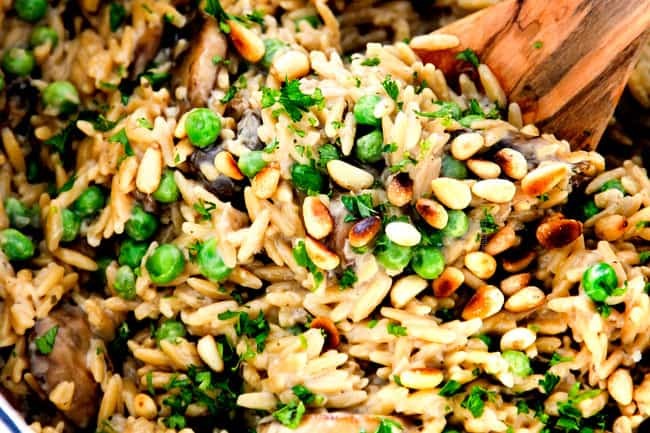 Want to try this Orzo Pasta recipe? Pin it to your Sides or Holiday Board to SAVE for later! 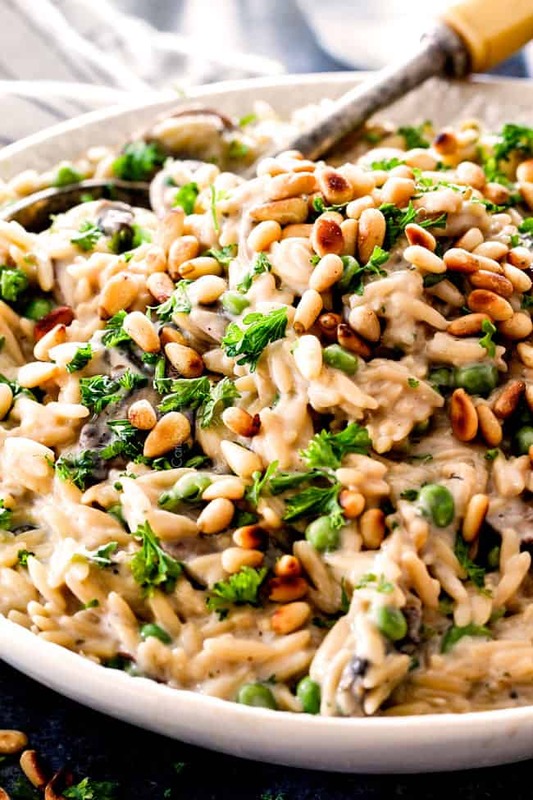 25 Minute Creamy Mushroom Orzo Pasta in Asiago Thyme Sauce is OUT OF THIS WORLD delicious! It is gourmet enough for special occasions but one pot EASY for everyday. It is completely customizable with different veggies or add chicken, shrimp, beef or Italian sausage and call it dinner. Don't Submerge Mushrooms. Don't submerge your mushrooms in water to clean them, instead use a damp paper towel. If you rinse mushrooms in water, they will absorb water like a sponge and not brown as well or become as flavorful because they are full of water. **Asiago: Asiago cheese is wonderfully sweet and nutty. If you would like a less pronounced taste, use 1/2 cup. We like 3/4 cup around here but that does mean a strong Asiago taste. You can add less then add more to taste if you wish. Cheese Substitute. 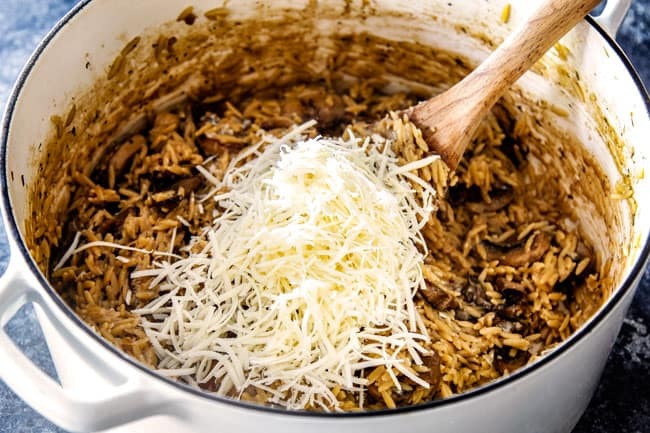 You may substitute Asiago with Parmesan although I prefer Asiago, so I highly suggest you try Asiago one of these times - its flavor can't be beat in this orzo pasta recipe. This recipe looks amazing. This will be yummy in my bowl while watching Hallmark movies. Thanks for sharing. mmmm! I am loving that idea! Doesn’t get better any better!